Boost your wellbeing and set your intentions for a vibrant year ahead! Enjoy daily yoga practices and walking on the hills, seasonal storytelling by the fireside and a workshop in nourishing body and spirit with lovingly prepared and healthy food. This is a week to retreat, renew and re-energise, with time to socialise and have fun, and time to reflect. Monday: Arrive from 4pm, dinner at 6.30pm. Followed by a yoga practice to relax and release from your journey. Tuesday: After breakfast, we’ll take an inspiring walk on the Quantock Hills to enjoy the big views and focus on the horizon to think about our year ahead and what we’d like to manifest. Bring a journal or sketchbook to record your thoughts and ideas. (If the weather isn’t so good, we’ll do a mindful walking practice indoors with an opportunity to explore your dreams and intentions for the year and to embody them in a very practical and fun way that really works). After lunch there’ll be some free time for socialising or finding a quiet spot to read a book. 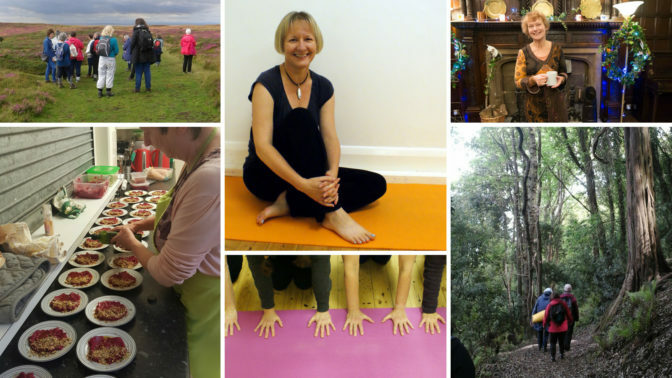 Each day the late afternoon session will be an indepth yoga practice led by Tracey Roberts, encompassing movement, balance, breathwork and some of the theory and philosophy of yoga. The practice will end with a meditation or a guided deep relaxation, all on the theme of nourishing ourselves at this dark time of the year. You’ll learn how to listen to the body’s innate wisdom, responding with intuitive movements and supporting the immune system to bring you into balance and wellness. After dinner, we’ll join Sharon Jacksties for an evening of fireside storytelling in the bar. Sharing stories is one of our oldest art forms and can help us make sense of the recurring patterns and themes in our lives. It can be transformational and is always lots of fun! Bring your dreams and desires and we’ll weave together a magical story of the year ahead through Sharon’s wealth of seasonal tales. Wednesday: In the morning Chrissie Godfrey will share her expertise in imaginative vegetarian and vegan cookery. We’ll discuss what nourishment means to us and the relationship between food and the spirit in which it is prepared. Chrissie is an advocate of fresh seasonal produce and shopping with low food miles in mind. We’ll savour ingredients through all the senses and prepare our lunch together. Learn how to nourish your body and spirit with vibrant food, prepared with love! Followed by yoga in the afternoon and an evening gathering. Thursday: Weather-permitting, we’ll enjoy another morning walk, or an alternative indoor meditative movement practice. The afternoon yoga session will draw together everything we’ve explored during the week, giving you plenty of ideas to take away. The week will close with a celebration for Wassailing night – the tradition of scaring away the bad spirits in the orchard to ensure a good harvest of cider apples. Wassail translates as ‘be hale’ or ‘be well!’. A guided meditation will lead you on an inner wassailing ceremony, letting go of what no longer serves you well and blessing your ‘inner tree’ to bring forth a good harvest for the year ahead. The yoga practices will be exploratory, mindful, nurturing and fun. Everyone works at their own level, so sessions are suitable for all, from beginners to those with an established practice. The walks will be sociable and fun, with a bit of creativity thrown in, and planned around the weather and the abilities of the group. Walking from Halsway Manor nearly always involves a steep climb (and descent!) and requires a reasonable level of fitness, but we’ll take our time. A walking pole will be useful as the footpaths and lanes get very muddy. Car sharing will be necessary if we decide to go further afield. Bring a yoga mat (if you have one), sturdy walking boots and outdoor clothes for all weathers. Sharon Jacksties has been telling traditional tales of wonder and delight for over 25 years. Working here and abroad, she has been happy telling stories to all ages in venues that vary from bus shelters to the National Theatre. She shares stories from all over the world, some of which have never been heard on these islands before. Sharon is also the author of ‘Somerset Folk Tales’, her adopted county, and co-director of The Summerlands Storytelling Festival. During 2018 Sharon will be busy developing Festival after its initial successful year; returning to Romania to teach storytelling; and welcoming the publication of Somerset Folk Tales for Children – a sequel to the adults’ version. She has a wide practise in ‘applied’ storytelling, working in therapeutic settings and teaching staff about the uses of story in health and education.